A social enterprise based in the Amman Valley has been granted £4,500 through the community benefit fund administrated by Gwaun Cae Gurwen Community Council. Organised KAOS (Keeping Adolescents Off the Streets) works through the concept of social circus engaging young people to broaden horizons, challenge themselves and encourage positive life choices. 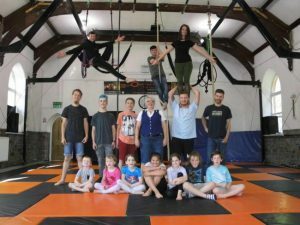 They do this through various activities which are based around the skills found within circus activities. The main objective is fun and excitement which is seen on the faces of those taking part. Nicola, founder and Managing Director of Organised Kaos, has worked tirelessly over the many years, securing funds and improving facilities for this social enterprise. Over the last two months, the group have been delivering activities and performances throughout Wales, including being part of the Volvo Race village in Cardiff, the Womeninspire awards at the Wales Millennium, and were privileged to devise and perform at Coastal Housing’s 10th year anniversary.